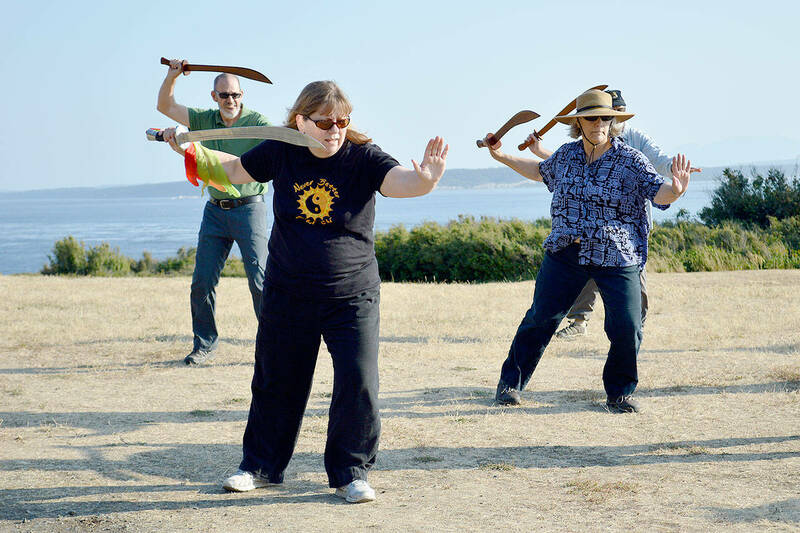 Onlookers who witnessed a group of sword-wielding people Tuesday night at Fort Casey need not be concerned — the swords are wooden and simply used as an extension of energy and a counter balance. Lynne Donnelly, co-founder and president of Whidbey Island Holistic Health Association, has been practicing t’ai chi for 39 years and teaching it for 23. The saber form is one of her favorites of the practice, and this summer she led an outdoor workshop on it for the first time. The group of nine students she guided through a 36-move form Tuesday have all been practicing t’ai chi for a while and are her more advanced crew. Many of them started taking classes at Donnelly’s Freeland studio to improve their balance. “I have a lot more balance and I’m a lot more sure of myself,” said Frank Worster. He took the saber class because he agrees with Donnelly, it’s fun. “Sometimes I feel like a pirate,” he said with a laugh. Normally, Donnelly teaches t’ai chi in her studio, but there isn’t enough room for sword swinging there. For the summer workshop, the advanced group met at Fort Casey for the 90-minute class. As the sun lowered in the sky Tuesday, Donnelly led the students in moves with names like “golden pheasant,” “dragon jumps,” “fair lady” and “chomp and stomp” in the grass outside Admiralty Head Lighthouse. Nancy Sharp has been practicing for over three years, but said she wasn’t sure how she felt about the weapon-wielding aspect of the form at first. Donnelly said said she’s received a lot of positive feedback and she plans to hold another saber workshop next summer. She tries to keep her classes fun because a lot of the positive health benefits come from the social aspect of her class, she said. Allan Ament has been taking Donnelly’s classes for around seven years.